In my latest Sutton Trust blog, I look at the new Parent Power? report published today. Parent power has supposedly been around since league tables and Ofsted reports gave parents the right to pick a preferred school. But it has benefited some more than others. True parent power must be about providing fair access to good schools and to the enrichment activities that help to create successful adults. This post also appears on the Public Finance website. In my latest Sutton Trust blog, I note that arguments over free schools miss the importance of reducing in-school differences in the quality of teaching. Free schools were introduced in 2010 as part of a ramping up of the academy model introduced by Labour. Academies share a number of characteristics: they are funded centrally rather than through local government, which means they receive more of the funds that are otherwise pooled locally; they have freedoms to vary non-core subjects in the national curriculum. They can set their own pay scales; and like foundation and voluntary-aided schools, they have freedom over their land and buildings, though these remain in trust. Under the original model, all academies had to have sponsors: academy chains or trusts, universities, philanthropists or successful schools. An initial expectation that sponsors made a financial contribution was dropped. ﻿Labour’s academies were largely targeted at failing secondary schools in disadvantaged areas. There were some exceptions: a small number of independent schools entered the state sector as academies and a couple of outstanding schools were allowed to convert in return for sponsoring weaker schools in new chains. The academy chain model developed at this time, with organisations like Ark, Harris and United Learning growing significantly. ﻿The coalition extended this sponsor model to primary schools, though its initial focus was on allowing successful schools to convert: half the 3200 secondaries in England are now academies, though fewer than 10 per cent of primaries are. They also created a model for new academies which they called free schools. Legally, they are little different from academies, though opponents have seized on the fact that all their teachers do not have to have qualified teacher status. If they have a faith character, they are also expected to keep 50% of places for those of other or no faiths, though the nature of some faith schools is such that this stricture is unlikely to be invoked. However, this research was focused on sponsored academies. The selling point – or problem, depending on your perspective - with free schools is that there is no single model. So just as the experience of the Derby Muslim school cannot be translated to the Bristol Cathedral School’s primary that was celebrated on the Today programme this morning, the success stories of some free schools won’t necessarily translate into successes for others run on very different lines. And that is as true of academy chains, where some models appear more successful than others. In a separate report for the Sutton Trust, Eric Hanushek from Stanford, with Stephen Machin and Richard Murphy at the LSE, have shown that English schools could improve their low position in international league tables in Reading and Mathematics and become one of the top five education performers in the world within 10 years if the performance of the country’s least effective teachers was brought up to the national average. Richard Murphy’s March report for the Trust highlighted how schools can use appraisal to improve performance, and it is an area where the Sutton Trust will do more research in the coming year. The truth is, whatever the arguments over school structures, it is in improving the quality of our 430,000-strong teaching workforce that the greatest gains in standards can be made. Those free schools and academies that successfully narrow that gap are the ones that will succeed. Seamus Heaney’s death brings great sorrow to Ireland, to language and to literature. He is mourned – and deeply – wherever poetry and the world of the spirit are cherished and celebrated. For us, Seamus Heaney was the keeper of language, our codes, our essence as a people. When he took his children to school in Ashford…. the headmaster wrote in the column marked ‘Occupation of Parent’, two small, quiet syllables…. ‘file’. As he put it himself, ‘there were no more alibis’. Not too long ago he gifted us with his archive. Bound words…portable as altar stones…….unleavened elements. Today, it would take Seamus Heaney himself to describe the depth of his loss to us as a nation. We are blessed to call Seamus Heaney our own and thankful for the gift of him in our national life. He belongs with Joyce, Yeats, Shaw and Beckett in the pantheon of our greatest literary exponents. Our thoughts and prayers are with Marie, Michael, Christopher, Catherine Anne and the extended Heaney family. I want them to know that, on this sad day, there are no words to describe adequately our nation’s and poetry’s grief at the passing of Seamus Heaney. Nor indeed, of our shocking pride, in ár bpríomh fhile. Friends and colleagues were bemused. Nashville? !, the word said with barely disguised incredulity, the query left unsaid. We had paid a fleeting visit in 1996, but had seen far too little as the bus tour of the South had us staying out of town. Having visited dozens of cities, including New Orleans and Memphis, the self-styled Music City lived up to expectations and must rank among the top of places to spend a long weekend. Not only for the music, though that is great - and more varied than sceptics might expect - but also for a good sense of its own history. We just had three nights in the town that has become synonymous with country music, but could happily have spent seven. There was so much to see, and so much music to enjoy. And with the TV series Nashville, and its music produced by T Bone Burnett, the city is enjoying a tourist boom especially at venues featured on the show. Of course, we visited the Country Music Hall of Fame. There is a lot of kitsch, of course, with plenty of rhinestone outfits and dazzling boots, but there is also a good mix of country music and social history, including the role of the depression and the Dust Bowl, and a nod to Cecil Sharp and the roots of country in Britain and Ireland. A special exhibition on Bakersfield was fascinating, showing the California town brought forth more than Buck Owens and Merle Haggard, and was as important as Nashville in its day. Sitting alongside the Steinway in RCA Studio B where Elvis recorded most of his records (only a few were recorded at Sun City in Memphis) - and where the Everly Brothers and many country legends recorded their hits – felt like being a part of pop history. And walking the corridors of the Ryman Auditorium – original home of the Grand Ole Opry – evoked a sense not only of music history, but also the politics and culture of the South. It saw political rallies, Presidents passing though, great opera singers like Caruso and McCormack, and the full impact of women’s suffrage and civil rights politics in its day. There was music coming from every doorway on Broadway from 11am until late, and the standard in the honky tonks was pretty good. But we had real treats with a group of up and coming singers at The Listening Room café, which serves good food too, wonderful bluegrass at the Station Inn in the Gulch (expect to pay just $30 for cover, a pizza and two beers), and superb blues at the Bourbon Street Blues and Boogie Bar in Printers’ Alley. Unfortunately, we had no chance of getting into the Bluebird Cafe, since the TV series made its name. We had seats near the stage for a varied mix of acts at the Grand Ole Opry – most impressive was Holly Williams, granddaughter of Hank Senior, but there was a mix of rock and traditional country, good Cajun music and a few ageing legends still in good voice too – interspersed with the in-you-face advertising that characterises American radio. The Opry is now 11 miles out of town, but worth the $25 cab ride for a unique experience. The two hour show is split in four sections, and gets through a dozen acts a night. But Nashville has more than music. The Tennessee State Museum (free admission) is currently hosting an excellent temporary exhibition of civil war documents, and a well presented permanent exhibition on the civil war and the political and social history of the state. I hadn’t realised there were Black politicians elected to the Tennessee legislature in the 20 years after the Civil War, though none from then to the 1960s, as the appalling segregationist laws took hold. A 12-mile $30 taxi ride out of town took us to Andrew Jackson’s home, The Hermitage, a well-preserved early 19th century home in a 1200 acre farm, with surviving slave quarters preserved on site. Jackson was the first US President elected my popular white male franchise and helped found the Democratic Party, but was also a slave owner and a pretty unscrupulous politician in many ways. An admirable warts and all approach is taken at the site, which is one of the most visited Presidential homes in the US. We stayed at the charming century-old Hermitage Hotel . Its old-fashioned, well-equipped and cosy rooms, delightful staff and a location in walking distance of most attractions, make it a great base in the city, though there are plenty of less expensive alternatives downtown. Two useful things that Nashville does, which others could emulate. First, while we were there the stores were enjoying a boom thanks to a state tax holiday, on clothing worth below $100 and on computer equipment up to $1500 value and school supplies. It may give a fillip to families, but is undoubtedly helping trade and the local economy too (although it is also true that the biggest lines were at the Apple store). Its temporary nature – three days only – suggests a more productive approach than a long-term VAT holiday. Second, the city (as does Miami) has set fares from the airport to Downtown and other zones, and to the Opry. Such a scheme could provide reassurance at British and European airports (especially, to pick two from the top of my head, Prague and Madrid, where the taxi drivers are particularly helpful – to themselves). Why not have pupil premium rewards too? In my latest Sutton Trust post, I welcome increased pupil premium accountability, but wonders why ministers don’t also reward schools that successfully deliver for their disadvantaged pupils. News that the Government is finally putting flesh on its pupil premium accountability measures should mean that the ministerial subsidy for poorer pupils starts to acquire some teeth. On Tuesday, Schools Minister David Laws announced that Ofsted would place greater emphasis on schools’ performance on disadvantaged pupils. Schools where those students were not making good progress could lose their outstanding status. He also detailed new ways that schools would be held accountable in performance tables for the performance of the one in five pupils who are eligible for the £900 a year grant, which goes both to pupils on free school meals and those who have recently been eligible. On average schools receive £5000 a year per pupil through the dedicated schools grant, but some inner London councils get more than £7000 per pupil. Statistics show that 38.5% of these pupils reached the five good GCSE benchmark in 2012 compared with 65.7% of other pupils, a gap of over 27 percentage point. In future, the league tables will include data on the attainment of disadvantaged pupils, their progress and the gap with their peers. So that schools with small numbers of pupil premium recipients are more fairly held to account, there will be three year rolling averages alongside data for individual years. Add to that the appointment of the former headteachers’ union leader John Dunford as a pupil premium champion, and the package is undoubtedly a considerable advance on a situation where schools were effectively left to spend the extra cash as they chose. To be fair, the National Foundation for Education Research survey of teachers for the Sutton Trust his year showed that teachers – and heads in particular – are starting to turn to research, particularly the Sutton Trust/Education Endowment Foundation Toolkit, in deciding how to spend the money. 67 per cent of school leaders – up from 52 per cent last year – said their school now consults research in deciding their pupil premium priorities. 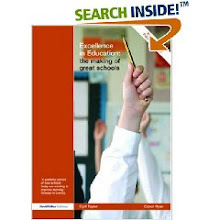 43 per cent of school leaders whose schools consider research evidence use the Sutton Trust/EEF Toolkit. Schools are less likely to spend the money on reducing class sizes – a relatively unproven method – and more likely to spend it on early intervention (proven, but expensive) and one-to-one tuition. However, the most cost effective measures, such as training to improve feedback between teachers and pupils, an important part of teacher development, are also still relatively rarely cited too, as are peer-to-peer tutoring schemes, where older pupils typically help younger pupils to learn. A separate independent evaluation by social researchers TNS-BMRB and the universities of Manchester and Newcastle for the DFE this week suggested that 45 per cent of schools use academic research and 70 per cent use evidence to inform spending decisions. Three quarters of school use additional staff to support disadvantaged pupils. The pupil premium is one of the Government’s most important flagship policies, as important to the Liberal Democrats in the coalition as Free Schools are to the Conservatives, though both policies featured in the manifestos of both parties as well as the coalition agreement. That makes it all the more surprising that ministers didn’t go further in their announcements this week and start to tie a proportion of pupil funding to school success in meeting the measures against which schools will in future be judged. To be fair, it is unclear that the pupil premium will rise much above its current level of £900 per pupil. George Osborne merely said it would keep pace with prices, in his Spending Review statement. It had been expected to increase to £1200 a year by 2015. But as the Government moves towards a National Funding Formula – also announced by the Chancellor - it will need to decide how to allocate the substantial extra resources already allocated by many local authorities to schools with large numbers of disadvantaged pupils. The Institute for Fiscal Studies has pointed out that pre-pupil premium extra funding in the system attached to deprived pupils amounts to £2000 in primary schools and £3000 in secondary schools. If the Government really wants to incentivise more effective use of the premium, it should consider rewarding schools that do well in the new league table rolling average measures, and provide them with additional funding that they can use to reward the staff responsible or to make other improvements within the school. Such team-based rewards can be more popular and much less expensive than performance related pay for individual teachers. The right rewards with advanced accountability could combine to give the pupil premium real teeth. I argue in a new Centreforum report that university endowments can make a contribution to postgraduate funding. Sutton Trust research has highlighted the growing importance of postgraduate degrees in today’s labour market. Stephen Machin and Joanne Lindley have shown that 11% of 26-60 year-olds in the workforce now holds a postgraduate qualification, up from 4% in 1996. They also showed that somebody with a Master’s can on average expect to earn over £200,000 more over a 40 year working life than someone only holding a Bachelor’s degree. The Sutton Trust report highlighted how the recent growth in UK postgraduates, dominated by international students, poses a threat to social mobility. This makes it all the more important that postgraduate courses are affordable to the brightest graduates, regardless of financial circumstances. Universities and government need to think imaginatively about how to fund them. Without action to enable bright students from all backgrounds to access postgraduate qualifications based on their ability rather than their ability to pay, this could become yet another barrier for those from low and middle income homes. The Trust supports targeted state-backed loans for postgraduates. But Government is concerned about affordability, given the growing cost of the current student loan scheme. One way to keep costs lower would be develop income-related bursaries funded by universities through their alumni alongside means-tested loans for postgraduates. Tim Leunig’s earlier research for Centreforum has shown that while there is some funding available through university bursaries, research councils and other sources, fewer than 4% of students on taught master’s programmes receive sufficient funding to cover their fees in full. Most universities offer some partial bursaries, but these are often a fraction of the costs of fees and living costs, which can be £18-£20,000 a year, depending on the course. This is an expensive proposition for graduates with debts already set to exceed £40,000 from their undergraduate studies. With a state regulated system of undergraduate fees and loans in the UK, and substantial mandated access funds linked to the new fees regime, there is a strong case for focusing a growing endowment pot on postgraduate studies and research. For this to happen, UK universities need to grow their endowments. Only Oxford and Cambridge currently have endowment funds comparable in size to the top 20 US universities, with the next largest, Edinburgh, significantly smaller at £248m. The 2004 Thomas report led the Labour Government to introduce a match-funding scheme designed to stimulate greater fundraising by English universities from alumni, and the development of larger endowment funds. That scheme, which ran from 2008-11, had some success: annual fundraising by UK universities rose from £513 million to £694 million. But the potential is much greater. While US Ivy Leagues have always had large endowments, much American alumni fundraising is relatively new. Many state-funded universities have only developed their funds in the last 50 years: for example, the University of Florida increased its annual donations from $2m in 1976 to produce an endowment fund now worth $1.3 billion. Only 1.2% of UK graduates donate to their universities regularly, compared with 9% of US alumni. A Higher Education Funding Council for England report in 2012 proposed a target of 5% for the UK within the next 10 years, with some universities achieving double digit rates, to put the UK onto the US track. Explicitly linking some of those funds to support for postgraduates could make giving more attractive to some donors. Some universities already do this. Sheffield has alumni fund scholarships, funded by donations from 1500 alumni each year, worth £2000 each, and targeted at bright students who might not otherwise be able to study there. However, such scholarships remain small scale: in 2013, they plan to provide them to 15 students, but only provided 6 in 2012. Others with larger endowments say they are relatively generous. Oxford, with £3.7 billion in university and college endowment funds, says that 62% of its research students and 17% of its students on taught Master’s courses receive full scholarships covering fees and living expenses. Such endowments may not cover all postgraduate costs, but they could make a significant contribution, when coupled with targeted student loans for those of modest means. Sheffield targets its scholarships to those who received maintenance grants as undergraduates. A similar approach more widely applied to those able enough to study as postgraduates would help ensure such support was well targeted where it was needed most. Government may not want to cover the full cost of postgraduate studies and living costs, given the prevailing climate. While wealthier UK and overseas graduates may be able to turn to family funds, those for whom a postgraduate degree is the final rung on the social mobility ladder are unlikely to have access to such resources. Such students should have access to more means-tested bursaries, funded by universities through alumni fundraising. For that to happen, universities will need to improve their fundraising capacity. Government should make it easier for them to do so: the tax system needs to be simpler for large donations, and more pump priming should be available to enhance fundraising capacity. Postgraduate studies are the next social mobility frontier. It is now widely accepted that we need to do more through nursery education, schools and undergraduate access to enable bright young people from low and middle income homes to fulfil their potential. They must not encounter a brick wall when it comes to postgraduate study. A new partnership between alumni, universities and government could help ensure they don’t. 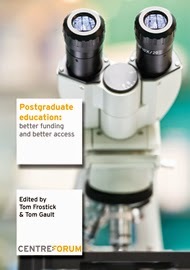 The Centreforum report Postgraduate Education: better funding and better access is edited by Tom Frostrick and Tom Gault and available at the Centreforum website. This is a gross figure, so it doesn’t allow for lost earnings, fee costs, extra taxes due or inflation, as some other analyses showing smaller premiums have done. Cambridge suggests these figures for most courses at http://www.admin.cam.ac.uk/students/studentregistry/fees/costs/coursecost/costs2013v9.pdf . Taught course fees for home or European students at Sheffield and Newcastle universities are typically £5000-£6000 a year, with research fees starting at around £4000 a year, but often much higher depending on the course. http://www.suttontrust.com/research/university-fundraising-an-update, drawing on data from ‘Caritas Higher Education Yearbook’ data in the UK and the US ‘Chonicle of Higher Education’. Information supplied by University of Sheffield. The University also uses alumni funding to provide £3000 scholarships for undergraduates. My latest Sutton Trust post looks at the drive to encourage more schools to use ballots in their admissions policies. This week, the Sutton Trust revived the argument for school ballots as a way of admitting a significant proportion of places to popular urban schools. Of course, it is not an uncontroversial idea, but it seems the best and easiest way to introduce some fairness into a system where our highest performing comprehensive schools and academies are more socially segregated than other schools in their area. After all, the evidence suggests that low and middle income students do better academically and socially if there is a mix of students from different income backgrounds in a school. When I was Tony Blair’s education adviser, in 2005, I still remember the Times front page when they picked up our plans to allow ballots – random allocation of places where a school is oversubscribed – and fair banding across all abilities to achieve a comprehensive intake. The Times chose to illustrate banding, a move designed to achieve a comprehensive intake, with an 11-plus exam paper. The Deputy Prime Minister, John Prescott, became convinced that we were planning a return to grammar schools and took some dissuasion on the point. I tell this story because ballots, a simpler measure without any tests, have their own perception difficulties. Most newspapers prefer the term ‘lotteries’ which has obviously negative connotations. But it has also been confused by the Brighton system, which allied some very tightly defined catchment areas with ballots to assist some families losing out under a traditional neighbourhood system. The losers were unhappy, and the winners stayed silent, and the way the catchment areas were drawn meant little change to social segregation. Yet, less arbitrary catchments can work. Some academies have been quietly getting on with it. After I did the Today programme on Monday, Liz Sidwell, the former schools commissioner and a dynamic former head of the Haberdashers’ Hatcham Academy in South London, tweeted to remind us that her school uses a mix of neighbourhood admissions and a ballot, splitting the two components 50:50. With huge local popularity for the school, this clearly makes sense. It’s the sort of model that the Trust would like to see more widely. On Monday, we also highlighted another South London academy, Platanos College in Stockwell, a ‘converter academy’ where nearly 60 per cent of its pupils receive free school meals, yet 80 per cent of all its pupils gained five good GCSEs including English and Maths in 2012, including 77 per cent of those on free school meals. Platanos uses banding, whereby a proportion of places are allocated to pupils of low, medium and high abilities to ensure that it takes a good mix of students. And although the Department for Education keeps quiet about it, academies and other schools that are their own admissions authorities – around two thirds of all secondary schools are in that category with a surge in converter academies – are allowed to use fair banding or ‘random allocation’ within the statutory admissions code, though the code bans local authorities from using ballots (Code, pages 13-14). Some academies may also give preference to pupils entitled to free school meals, just as all schools are required to do for children in care. (Code, page 10, note 22). Balloting is neither as unpopular with parents nor as rare as some suggest. Earlier polling by the Sutton Trust showed that almost as many parents backed ballots as a fair oversubscription criterion as proximity to the school, when given those two options for popular schools, with a majority making it the better option for faith schools. Moreover, research by RAND Europe for the Trust showed they are used in other countries, including for admissions to US Charter Schools and Swedish free schools and universities. Yet the reality is that the vast majority of comprehensives still admit on the basis of proximity to school, or an often ill-defined definition of religiosity in the case of faith schools, where ballots among members of a faith would be less arbitrary. Doing nothing should not be an option. Our research shows that the proportion of pupils from low income families, as measured by free school meal take-up, which is a measure of the social mix of the school, at our top 500 comprehensives is less than half the national average. More significantly, 95 per cent of the top 500 schools take fewer pupils on free school meals than their local average. Of the 16.5 per cent of pupils eligible for free school meals, just 36 per cent of them gained five good GCSEs last year, compared with 63 per cent of other pupils. With higher house prices close to good comprehensives and academies, the bottom line in England is, as Sir Peter Lampl put it on Monday, how good a school you go to depends on your parental income. This applies from independent boarding school fees to inner city school catchments. A significant number of comprehensives and academies are not academically selective, but are socially selective because of the neighbourhoods or faith communities they serve. Covert selection needs more than covert permissiveness in the Code. Ministers should actively encourage popular schools, particularly in urban areas, to consider ballots or banding. That way we could have a fairer – and more comprehensive – school system. Unless our best schools are open to all, we will never improve our low levels of social mobility. When I was a special adviser at the Department for Education in the late 1990s, it was seen as a measure of a Department’s success the extent to which it achieved legislation in the Queen’s Speech. This essentially macho test often led to more legislation than was strictly necessary to achieve policy goals. Many people forget that although the Labour government needed legislation to restrict most infant class sizes to 30, it needed no legislation to introduce the literacy and numeracy hours in primary schools. The latter were the result of a mix of persuasion and accountability, and were arguably more effective as a result. And legislation was too often used as a way to trumpet changes that could have been introduced less dramatically. Trust schools – the centrepiece of Tony Blair’s 2005 education reforms – were a good example. As with Michael Gove’s first academies legislation, the essential architecture was already in place, and what changes were needed could have been introduced with less fanfare through regulations. So, it is no bad thing that there was no education legislation in this year’s Queen’s Speech. Of course, that didn’t stop the Government using the occasion from getting Her Majesty to remind Parliament of changes already in train, such as the curriculum overhaul or performance pay for teachers. But nobody would argue that Michael Gove is any less powerful because he hasn’t got a fifty or a hundred clause bill to take through Parliament over the next twelve months. And I doubt any of his junior ministers – who would be tasked with the legwork – is overly concerned either. However, what it does mean is that it is all the more important that changes the Government is introducing get the scrutiny they deserve, and that they are subjected to the sort of rigorous evaluation – usually through randomised control trials – that the Sutton Trust and the Education Endowment Foundation are using. That is important not just for ministers who want to ensure that their reforms are making a difference to results, particularly for the poorest pupils, but also if they are to gain buy-in from teachers and headteachers. With more than half of all secondary schools now having academy status, as well as a growing number of free schools and university technical colleges, schools are getting used to having more freedoms than before. And while complex legislation can be important on some issues – such as ensuring a fair admissions code – it is a blunt instrument over issues such as the curriculum or performance related pay. Over-complexity militates against successful reform. When Estelle Morris first introduced performance pay in 2000, the intervention of the teaching unions ensured the whole process was wrapped in endless bureaucracy. Leave aside for a moment the perfectly valid issue of the impact of PRP on attainment – though Gerard Kelly’s recent TES piece show why in this case there are other issues to consider – the real problem is that legal issues come to outweigh the flexibility that allows heads to reward good teachers in a straightforward way. A less complex system may prove to be more effective in overcoming the culture against PRP in some schools. And we might then have some serious research on the issue too. But those increasingly independent state schools will equally need to be persuaded on the curriculum – including on the detail now planned in subjects like history – and on other issues where ministers feel strongly. As they do so, it is important that they use evidence rather than past practice or even DFE guidance to make their decisions. That’s why the increasing popularity of the Sutton Trust/EEF Toolkit is so important. Next week, we plan to publish new evidence of just how popular it is becoming. But in the meantime, we should reflect that giving Michael Gove and schools a break from the 2014 Education Act is not only no bad thing, it may allow the breathing space needed for genuine reform to take place. Are fees putting off working class boys? In my latest Sutton Trust blog, I look at new evidence suggesting that working class boys may be being deterred more than girls by higher university tuition fees. Students are well into the first year of higher tuition fees. While 54,000 fewer young people started university in 2012 than in 2011, the Government has been congratulating itself that the dip was not much greater. And the water has been muddied by the changes in student controls that took effect just as the £9000 fee cap was introduced. Moreover, this year’s applications suggest that there is some improvement on last year’s dip. So is all well in the world of higher fees? The truth is it is too early to tell. And a new report this week from the Independent Commission on Fees highlights a number of areas where there is some cause for concern. The first is what’s happening to boys, particularly working class boys. The Commission’s study of UCAS acceptance data has shown not only that the gender gap continues to widen, but that it appears even more pronounced in the lower participation neighbourhoods. Women are now a third more likely to enter higher education than men, according to HEFCE, and the gender gap seems to have widened as a result of the new fees regime. Among UK residents, 143,600 women aged 19 and under were accepted to English universities in 2012 compared with 118,952 young men. This represents a decline since 2010 of 2.6% for girls and 4.0% for boys, and a 5.9% decline for girls and a 7.5% decline for boys since 2011. But in the 40% of English neighbourhoods where university participation is lowest, there were 1700 fewer boys aged 19 and under who were accepted for places in 2012 than in 2011. This represents a decline of 5.4% in the number of young men from these areas going to university this year. By contrast, the fall in the number of young women from these neighbourhoods going to university was smaller, at just 3.7%. Perhaps of more interest, since it discounts any surge into 2011 to avoid the higher fees, when compared with 2010, the number of young male acceptances fell by 1.4%, while young female acceptances increased by 0.9%. By contrast, between 2009 and 2010, male and female acceptances rose. In England, while the overall change in the gender gap in the less disadvantaged neighbourhoods was 1.6 percentage points between 2010 and 2012, the overall change in the gender gap in more disadvantaged neighbourhoods was greater, at 2.3 percentage points. Although the decline in male participation in the most advantaged neighbourhoods was even larger, 20,000 more boys go to university each year from the two top fifth neighbourhoods than from the two bottom fifth neighbourhoods. It means that the female: male ratio is now nearly 57:43 in the less advantaged neighbourhoods whereas it is closer to 53:47 in the more advantaged neighbourhoods. With 2013 applications, UCAS has suggested that this gap is persisting. Its January applications report noted that 18 year women remain a third more likely in England to apply to university than men, but this rises to 50 per cent in disadvantaged areas. If this is the case, it suggests that the information about the new loan repayments may be proving more attractive to young women than to young men, or that young men from disadvantaged areas are less likely to believe that the cost of a degree is worth it. Either way, there is a challenge here for policymakers to meet. The Commission’s new report has two other important findings that should cause policymakers to take pause. The first is the familiar data on mature students – those aged 20 and over – who had 7.6% fewer acceptances in 2012 than in 2010, more than twice the 3.3% decline for younger students as a whole. The decision to allow part-timers to have access to student loans hasn’t seen full-timers move to part-time courses either. HEFCE has shown a dramatic drop in part-time numbers, with 105,000 fewer students since 2010, or a 40% drop. This is important for access, as studying later is an important route to social mobility for those from less advantaged backgrounds, and it is vital that the impact of fees on this group is not neglected just because the reductions among young people are smaller. Part-time study is crucial for our society. It improves skills and kick-starts new careers – exactly what we need for the economy, employers and individuals during these difficult economic times. In response to the dramatic downturn in part-time students nationwide, unprecedented support is needed now to ensure part-time study thrives in future. And the other key finding is perhaps a warning shot at this stage, but one that will need closer scrutiny as the university-level data becomes clear. While there has been an increase in the numbers of young people from the most disadvantaged areas going to the least selective universities, there has been minimal improvement in the numbers going to the Sutton Trust’s list of the 30 more selective universities (which includes the 24 Russell Group members) and a small dip in the numbers going to the Sutton Trust 13 most selective group. While the only rises to the Sutton Trust 30 were in the lower participation neighbourhoods, the only quintile showing a dip in acceptances to the Sutton Trust 13 was the lowest participation group. This means that there is a widening gap between this group and other more advantaged areas, and those from the richest fifth of neighbourhoods are ten times more likely to attend these universities than those in the poorest fifth of neighbourhoods. Closer scrutiny of patterns among individual selective universities will be important here. Already, there is some evidence from HESA data that in 2011, the proportion of new undergraduates from state schools and colleges at the 13 top universities slipped for the fourth year in succession. There is clearly an important issue for the most selective universities and their recruitment from the poorest neighbourhoods – and it is one that the Sutton Trust will return to shortly. The Trust has also commissioned the Institute of Fiscal Studies to examine the potential impact of students leaving university with debts likely to exceed £40,000 on their ability to afford graduate study, buying a house, and having children. Their findings will be published later this year. So, the truth is that the jury is still out on fees. We need to see whether these findings for 2012 become clearer trends in the next few years. It is vital, meanwhile, that Government, universities and schools do all they can to reach young people with the ability and potential to benefit from university, particularly in areas where university participation is already low. In my latest Sutton Trust blog, I look a new report suggesting that the days of many traditional universities are numbered in the face of online and mass delivery challenges. In 1926, John Clarke Stobart, the classical scholar and Children’s Hour creator who was also the first BBC Director of Education, had the idea that there might be a ‘wireless university’, bringing learning to the masses in a way that traditional universities, then the preserve of a small elite, could not achieve. What followed was rather less ambitious: a series of 25 minute talks supplemented by study aid pamphlets. It would be another four decades before Jennie Lee started to develop her ideas for what would become the Open University in 1969. Those of us old enough to remember the late night OU broadcasts will forever have the image of the typical OU lecture from the 1970s imprinted on our minds. Nevertheless, despite an initial lack of technical sophistication, the Open University helped over 1.6 million people to gain a higher education. More recently, it has embraced the Internet with the enthusiasm due to a medium well suited to its ambitious approach to access, and it now boasts some 250,000 students worldwide with 1200 academic staff and 7000 tutors. Its model of delivery has been picked up across the world, not least in fast-growing large nations like India and China. Reading the fascinating new report from Michael Barber and his colleagues for the IPPR this week, one couldn’t help but think of the profound changes that the Open University made in providing access to higher education for many people, initially on TV and latterly via the Internet. At the same time, the model did not prove as disruptive as it might have to traditional universities which now educate nearly half the young adult population in ways not so different from the approach taken when J C Stobart was expounding his Reithian mission. Nor, despite its often impressive academic credentials, has it managed to challenge the grip of the elite universities in the UK. Barber and his colleagues argue persuasively that an ‘avalanche’ is coming in higher education which will completely transform the delivery and – in many respects – the nature of higher education. They say all universities face key challenges including the traditional degree structure, the need for specialisation, their links to employability and a devaluing of the worth of an ordinary primary degree. Of course, we have had some false starts before. I remember all too well what happened to the ill-fated e-university initiative, a construct that was perhaps too premature. Yet, with the growth of Massive Open Online Courses – bearing the unattractive acronym of MOOCs – the world could potentially become a smaller place for students. A relatively small but growing number of UK students now prefer to study in the US – some with the support of Sutton Trust summer schools. But some US universities including Harvard, MIT and Berkeley, using the EdX platform, are putting many courses and lectures online, opening them up to mass audiences. In developing countries, online may be the only way to achieve mass higher education, but how much will it affect tradition universities in developed nations? Barber et al argue that it will require universities to adopt one of five models: the elite, the mass, the niche, the local or the lifelong learning. That may well be true. Equally, they point to the impact of rising fees on students as consumers, and their rising expectations as a result. Students may start to demand more contact time and fewer enforced holidays. Already there are concerns that few students complete MOOC courses, with dropout rates as high as 90 per cent, though that could also reflect differing motivations for signing up. It may well be that students without a higher education tradition at home are the least likely to be able to sustain such course options. However, universities cannot afford to be complacent, and must acquire far more flexibility in their approach if they are to remain relevant in this brave new world, both in their traditional and online delivery. Universities will have to make the case for an experience that is collaborative, and which opens students up to networks that still feel more real than the social media alternatives that are supposed to act as substitutes. As importantly, they will need to show that they are delivering it. Of course, that may mean new ways of doing things. Warwick University, which ran some excellent summer schools for gifted and talented school students in the first decade of this century, has recently created a new online network – IGGY - that it wants to blend with face-to-face activities and use that as a way to encourage able students of all backgrounds to network. Whatever the mode of delivery, access will surely be as important an issue to all the new types of university as it is to traditional institutions. MOOCs must not become the poor man or woman’s alternative to a place at Harvard or Cambridge, which seem unlikely to forfeit their prestige or their role in developing leaders in all fields. Unless we are careful, there is a real danger they will do so. If elite institutions are here to stay, as Barber et al believe they are, new levels of global competition for talent will make it more important than ever to harness brainpower from the whole of society, not just a narrow elite. That social mobility challenge seems no more destined to disappear than the great universities of the world and their formidable brands. Good teaching is at the heart of good schools. We have done a lot to improve the quality of new teachers, but there has been much less focus on the quality of the existing workforce. Yet, while 35,000 new teachers enter the profession each year, the teacher workforce is 440,000-strong. Schools need to make the most of teachers’ talents if young people are to get a decent education. For a disadvantaged pupil, an excellent teacher can deliver the equivalent of 1.5 years learning in a year, whereas a poor teacher contributes just half a year: the difference is a whole year of a child’s education. That’s why it is important we evaluate the contribution that teachers are making and can make with the right support. A new Sutton Trust study, Testing Teachers, shows that the contribution that teachers make to improving exam and test results is the most reliable way to predict a teacher’s long-term success. The study, by Richard Murphy of the London School of Economics, drawing on the latest international research, shows that improved test scores are nearly twice as effective as student surveys and nearly three times more effective as classroom observations. But schools can’t simply look at a single year’s test scores to assess performance. A reliable and fair approach requires a sensible combination of these and other measures taken over several years, and might also include teachers’ contributions to sports and school trips. When Labour introduced performance related pay in 1999, it did so within a very bureaucratic framework that didn’t work as intended in most schools. By contrast, the education secretary Michael Gove is hoping that leaving schools to develop their own systems will improve results and see the best teachers more effectively rewarded. But without the right systems in place, schools may be no readier to do so now than they were in the past. So what are the characteristics of an effective system of teacher appraisal? Most importantly, it should involve clear standards, fairly and consistently applied. External advice can be helpful in getting this right, and could assure staff of its fairness and governors of its robustness. Teachers or school leaders involved in evaluation should be properly trained, and should discuss their evaluation fully with the teachers concerned. When using exam or test results, it is important to focus on value added rather than absolute results, as they are the most objective and comparable assessment of a teacher’s contribution. It is also important that the baseline for such comparisons is sufficiently robust. With classroom observations – where teachers or school leaders witness teaching in practice – the report suggests that those designed to help a teacher improve should be carried out separately from those used for appraisal, as this is more likely to promote honest feedback. Pupil surveys can also be used – particularly with older pupils – as they are the ones in most day-to-day contact with teachers, but when they are they should be clearly structured, be age appropriate, and should complement other measures. Getting all this right can have real benefits for pupils and teachers alike. Earlier research for the Sutton Trust has shown that if we were to raise the performance of the poorest performing tenth of teachers to the average, we would move into the top rank of the OECD’s PISA tables internationally. But there is a more compelling reason: by improving the quality of our teachers collectively, we can ensure that every child has a decent education, and is not held back by poor teaching. That is a goal well worth pursuing. Can we get a secondary consensus? In my latest Sutton Trust blog, I look at the implications of last week’s announcements on secondary school exams and the curriculum by Michael Gove. This is written in a personal capacity. Last Thursday’s unexpected U-turn by Education Secretary Michael Gove over his plans to replace GCSEs was presented by some as a sign that the most sure-footed cabinet minister in the coalition had come unstuck. Yet a closer look at what actually happened suggests that though his plans may not have had the full rebranding he envisaged, they remain rather more intact than commentators have suggested. While reformed GCSEs will no longer be known as EBCs, other changes announced last week could still have a profound effect on schools, what they teach and how they are assessed. Alongside the confessional appearance in the Commons, Gove also unveiled his plans for the national curriculum, a radical change in the key league table measure for GCSEs and confirmed his plans for those exams to remain linear and become more demanding. The draft national curriculum makes little change to range of subjects that students take – computing replaces ICT, but PSHE, citizenship and PE remain statutory requirements, even if their programmes of study are sharper and less prescriptive. The level of prescription in subjects like history – which is now wholly chronological – and English which has a level of detail on grammar unseen since the literacy hour – stands in sharp contrast to the notion that schools would be increasingly free to decide for themselves what they would do. Teachers are freer to decide how to teach, but are much more circumscribed in what they must teach, at least until the age of 14 (and, at least for core subjects, to 16). In that context, it was particularly surprising that Gove dropped plans to move towards a single exam board for each GCSE syllabus. He may have done so on the advice of Ofqual and worries about European competition law, but it was a reform that had wide support outside the exam boards and should be revisited. The context for the new Gove curriculum was set out in a speech to the Social Market Foundation last Tuesday, where his belief that a core body of knowledge should lie at the heart of schools was set out more sharply than ever before, with the Conservative Secretary of State choosing the Italian Marxist father of Euro-Communism, Antonio Gramsci as his chief witness, alongside more familiar contemporary advocates such as the American academic E.D. Hirsch. At the same time, Gove is proposing a number of changes to the league tables, which could have even more wide-ranging impacts on what schools teach. Instead of measuring schools primarily on five good GCSEs – at C grade or above – including English and Maths, they will be measured on English and Maths grade Cs and on an average point score based on a student’s best eight subjects. What might all this mean for social mobility and for disadvantaged students? On the one hand, there is a lot to be said for bringing greater clarity to the body of knowledge that children should learn. The curriculum had, arguably, lost the clarity it had in 2000 and earlier versions, and many will welcome this. It is also right to encourage greater breadth – and that would be welcome at A-level as well as GCSE, as Peter Lampl has argued recently. The challenge – and test – for the new curriculum will be the extent to which it is adopted by academies, the 50 per cent of secondary schools that are free to choose most of their own curriculum, and the extent to which today’s parents expect them to adopt it. There is a perfectly good argument – as Gove made in his SMF speech – that children need a body of knowledge if they are to benefit fully from acquiring the research and study skills that most teachers – and the evidence from the Sutton Trust/EEF toolkit – suggest can play a big role in boosting attainment. A false dichotomy has been created between knowledge and skills, and both need to be seen as an important part of children’s educational development. Of course, for students who go to university, it is right that they should be encouraged to take a strong suite of academic subjects, and it is to be hoped that the new GCSEs have the rigour to bring an end to the soul-destroying annual ritual of criticising the achievements of young people at the moment when they learn how well they have done in their exams. Yet a big gap in the Government’s thinking lies in what happens after the age of 14 to those for whom a more vocational or technical education would be more motivating. EBCs may be gone but the EBacc remains, and will lie at the heart of the 8-GCSE measure in the new league tables. For students taking 8 GCSEs, it is perfectly reasonable to expect them to take five EBacc subjects, and they now have a chance to have achievements in other subjects like art, technology and religious education recognised. This has pleased those lobbying for such recognition. Kenneth Baker’s University Technical Colleges start students on technical and vocational pathways from age 14. Further education colleges will be able to recruit from that age. Yet because of the undoubted abuses of vocational equivalences in the past, all technical and vocational qualifications, regardless of depth and intensity, have equal weight in the league tables. The Government still has to find a satisfactory way of recognising the achievements of those who take a more technical curriculum, and it should use the reformed league tables to do so. To argue this point is to be neither Luddite nor defeatist, but it is to recognise that for some students – a minority maybe but at all ability levels – an academic curriculum post-14 will not enable them to fulfil their potential. There is a real chance to develop a lasting consensus on education, one that outlives changes in Government, and one that caters for the needs of every child at different phases of their education. Last week’s suite of announcements could herald a different approach. For that to happen, the consultations on the curriculum and league tables need to be as open to reasonable change as that on GCSE reform turned out to have been.